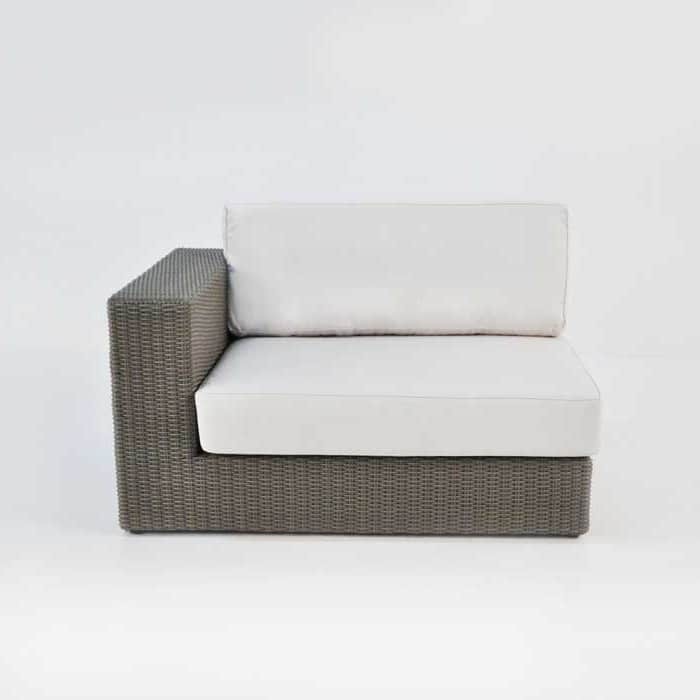 Let yourself experience comfort and style with the modular beauty of the Austin Wicker Outdoor Sectional Right Arm Chair in Kubu. 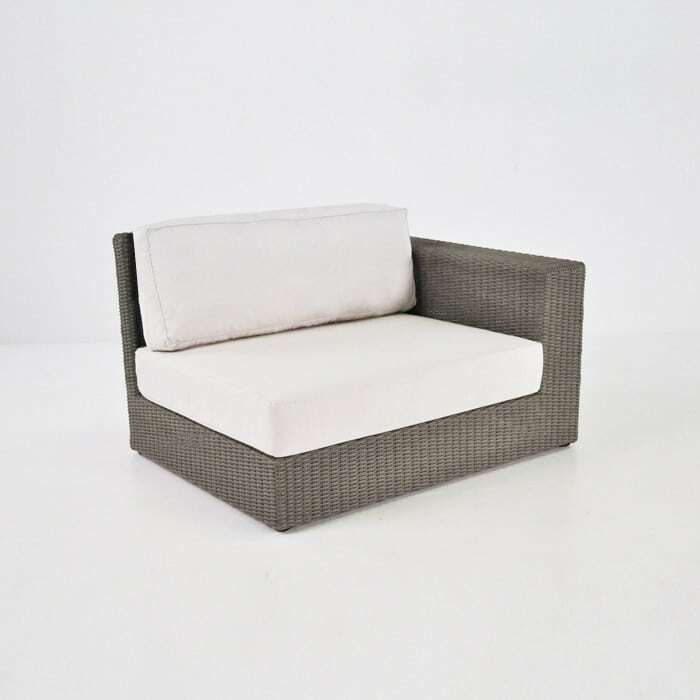 Part of the extensive 7 piece Austin Collection the Austin Wicker Outdoor Sectional Right Arm Chair in Kubu enables you to customize the length and shape of your sofa! 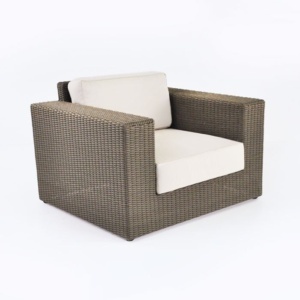 The Austin Wicker Outdoor Sectional is available in 4 modular pieces – Corner, Centre, Right Arm and Left Arm, so you may make it as long or short as your space allows! Each piece is 71cm high and built into solid chunky frames. The Left and Right pieces boast a wide arm – perfect for resting drinks, plates and trays on, removing the need for a side table! 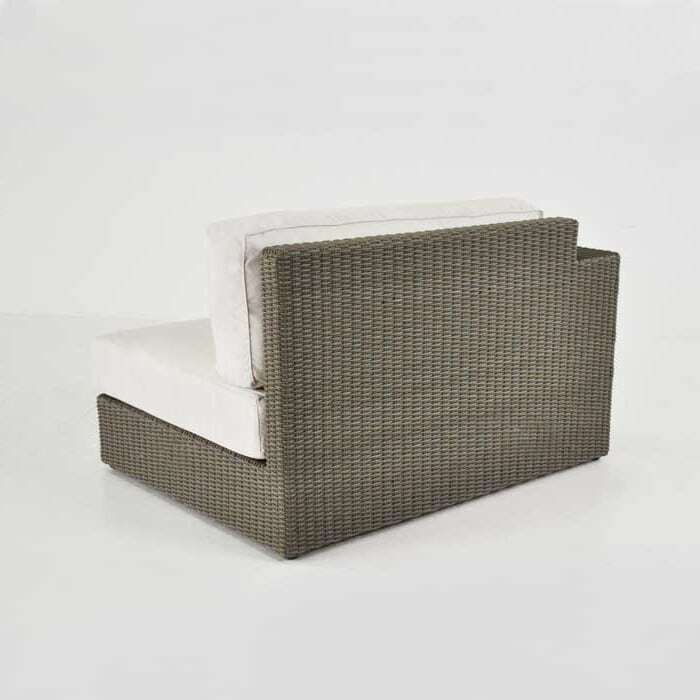 Constructed out of a powder coated aluminium frame and dressed with the long lasting, award winning fabric Viro® wicker. Viro® is a non-toxic, recyclable, eco-friendly, polyethylene synthetic fabric, which because it is through-dyed and UV treated, resistant to the changing seasons and extreme weather. Viro® won’t discolour, morph or break, it is popular because although it is extremely durable, it still remains beautiful to look at and great to touch. 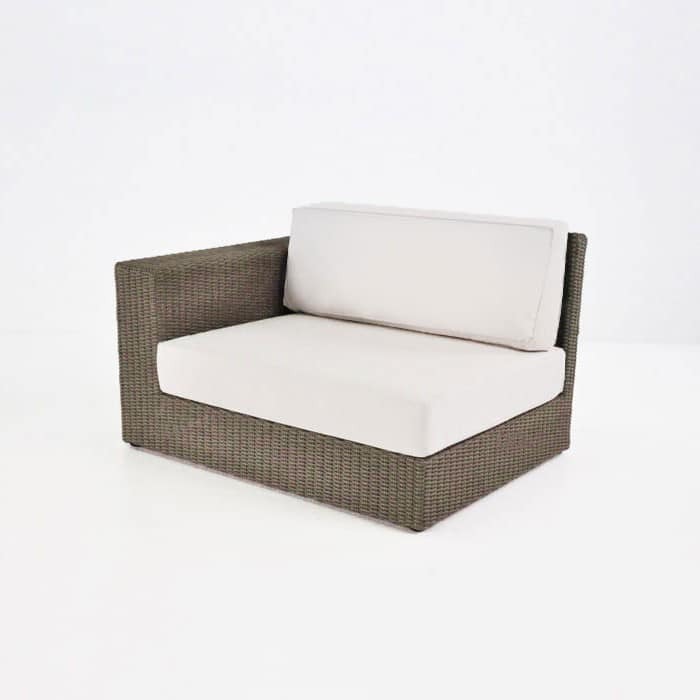 It includes FREE Sunbrella® cushions as pictured (shown in Canvas); this outdoor sectional is available in Antique Java and Kubu (Shown in Kubu.) The cushions too, being made with amazing Sunbrella® fabric, are now filled with QuickDry® foam so you can leave them outside overnight and through short rainfalls! 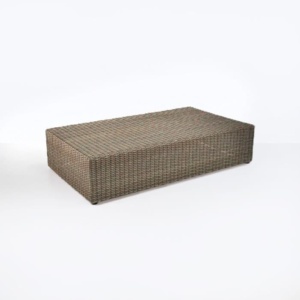 Design Warehouse now carries a range of All Weather Wickers, as well as our beautiful Grade A Teak, Reclaimed Teak, Raw Concrete, Mesh fabrics, Stainless Steel and Resin materials. So whether you’re looking for sumptuous deep seating, a dashing dining set, a loungey sun bed, comfy relaxing chairs, bold bar furniture or some sleek shading options; we have everything under one roof in our Parnell warehouse! We’d love to see you in store, but if you are in another part of our great country, please call us! Our sales assistants are in store from 10am everyday and available to discuss your space, and provide you with options and quotes for the most beautiful outdoor furniture that you can enjoy in your home for years to come. 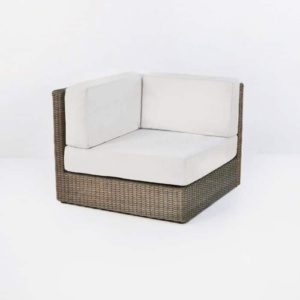 The Austin Wicker Outdoor Sectional Right Arm Chair in Kubu can be made into a tremendously long sofa with the addition of matching Centre pieces and a mirroring Left Arm. Imagine this splendid set facing your view with a low Black Concrete Coffee Table, defining modern style with the clean lines and gorgeous mix of materials. Make a warm, open family area on your large veranda with a ‘C’ shaped Austin Collection. 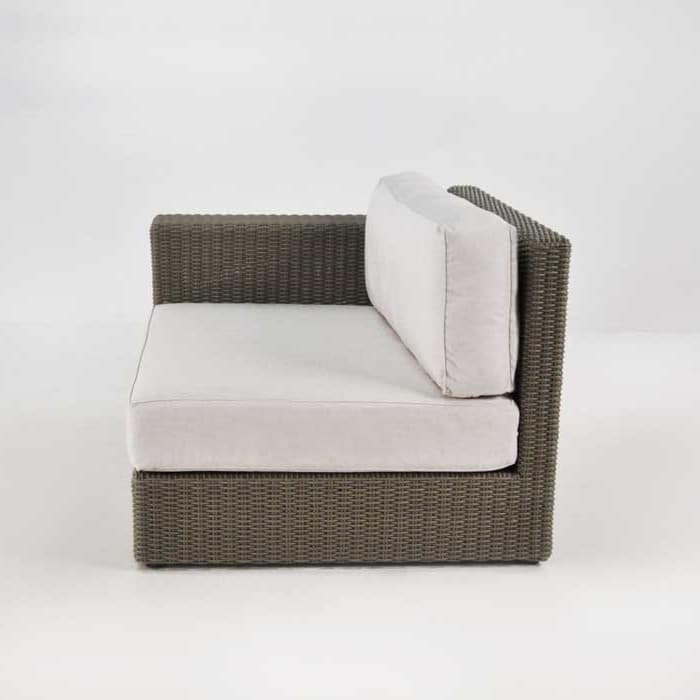 Start with a corner piece on each edge, a Austin Wicker Outdoor Sectional Right Arm Chair in Kubu and its Left Comrade on either end and fill with Centre pieces to make the area as large as you wish! 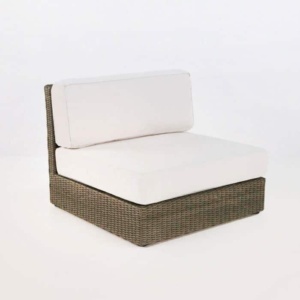 The Austin Wicker Outdoor Sectional Right Arm Chair in Kubu is a beautiful piece to have on its own as a chaise seat, or as part of a greater collection. The options are endless, all you have to do is choose yours!